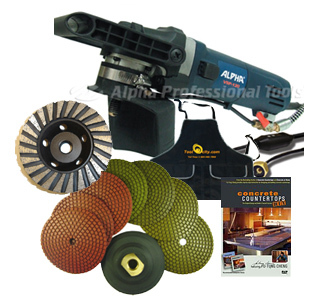 Applied Diamond Tools DBA Toolocity > Package Deals > Premium Concrete Countertop Polishing Package - Wet 4" or 5"
Premium Concrete Countertop Polishing Package - Wet 4" or 5"
additional 10% or more savings compare to purchase individually. The 7 pcs of concrete diamond polishing pads include 50 grit, 100 grit, 200, 400, 800, 1500 and 3000 grit with color coded velcro backing. Use a diamond cup wheel to expose aggregates before polishing if you choose to expose aggregates. Medium grit cup wheel is most suitable.